Stephen King’s ‘American fantasy epic’ is one of the most celebrated post-apocalyptic novels of our time. It is the story of a small group, survivors of a super flu, and their quest to found a new society out of the ashes of the old while at the same time confronting a nearly omnipotent, omniscient supernatural foe. King has said: ‘instead of a hobbit, my hero was a Texan named Stu Redman, and instead of a Dark Lord, my villain was a ruthless drifter and supernatural madman named Randall Flagg’. Mordor became Las Vegas, the Shire, to which two of the major characters return in the final pages of the book, Stephen King’s own bucolic Maine homeland. But the novel doesn’t only give nods to the post-apocalyptic and epic fantasy traditions: the denouement with Flagg and his followers, set in the mountains and deserts of Utah and Colorado, has the same ‘fantasy Western’ feel as King’s own Dark Tower series, in which Flagg also figures. A disaster at a US government weapons facility unleashes a super flu nicknamed ‘Captain Trips’. In fact, just in case the unleashing is confined to the USA, the government make absolutely sure it is exported to the rest of the world, and thus die 99.4% of the global population without recourse to nuclear weapons (though they will come in to the story later on). 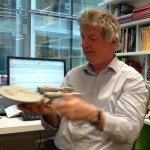 King concentrates on a small selection of these survivors. There is a grand criss-crossing of the Continent as we follow them. Stu begins in Texas, goes by way of Georgia to Vermont; Frannie Goldsmith, who will become his partner, begins in Maine meets with him in Vermont and together they travel across the Midwest. We follow Larry Underwood, a one-hit-wonder rock and roller from the West Coast to New York, from whence he escapes via the Lincoln Tunnel. His blind navigation of the wreckage and corpse-choked tunnel out of Manhattan is one of the scariest passages of the book and of nearly any other contemporary fiction: ’They would let him get halfway and then they would all begin to stir… to come alive…’ Does this passage contain the first fictional reference to ‘The Walking Dead’? Hodder paperback edition 320: ‘All you have to do is stay on the pedestrian catwalk and in no time at all you’ll be –/ — strangled by the walking dead’. The still centre of this ever shifting web is Mother Abigail, a 108-year-old black woman living in Nebraska who appears to be a conduit of God’s will. All the travelling groups dream of her and are drawn to her. And at the same time they dream of the dark man, Flagg. Some will succumb to his whisperings. All will be regarded by his Sauron-like eye. Like a later Gandalf, Mother Abigail orders her plucky band to march towards the enemy and they travel further west to Boulder, Colorado which will become the capital of their new republic. These vast journeys are given a human scale by close characterisation. The opening pages with Stu and Frannie are masterclasses of character build up. A group of idlers have gathered at a Texaco Station on the outskirts of a small town in the middle of nowhere. The conversation is inconsequential, ignorant even. They discuss how the government might solve the current economic crisis by printing more money. Only Stu ‘the quietest man in Arnette’ demurs. His voice cuts through the disinformation. Already he seems different, interesting… a cut above the ordinary as the first harbinger of the epidemic, a beat up Chevy with its plague-ridden driver hoves into view and promptly crashes into the gas pumps out front threatening a fireball. It’s Stu’s quick thinking that saves the day. Understated, dryly humorous, he’s the ideal hero. The same goes for Frannie. Her first scene is a deliciously-balanced scene of fear and hope as she tells her then boyfriend she’s pregnant and realises the guy is not for the long haul. The 1990 edition restores many scenes deleted at the behest of King’s US publisher. It’s interesting to note from the 1990 prologue that one of these was the one in which Frannie confronts her judgmental mother over her pregnancy. The painting of this tense family confrontation certainly drives our investment in Frannie’s brilliantly limned character. Boulder Colorado becomes the epicentre of resistance of the new society set against the bad voodoo of Flagg’s empire with its summary execution, witchcraft and murder. Spies are sent over the Rockies, few return. Unbelievable jeopardy and unexpected plot reversals, tragedy and some balancing joy all live together right to the end of this vast book. For an examination of good and evil in society on a grand scale, The Stand certainly pulls no punches. It’s a long journey but a long journey that validates our belief in basic human goodness and truth. I simply adore this book. I recommend it to everyone – I was given a 2nd hand copy in 1987 – my only previous exposure to King had been my attempt at reading Christine some years earlier, which I struggled with as it is more like a classic HORROR story, I abandoned Christine, throwing it far under my bed as it freaked me out! (although I have subsequently returned and completed the story). However, I still have my battered 2nd hand well read copy of The Stand. I call all crows Randall and so do my family who have never even read the book! With the rise of the popularity of this genre I now recommend it to a new generation. Frannie Goldsmith is my eternal virtual best friend. We met as sisters or at least peers, now time has passed and she is my virtual daughter. One of the two best novels I’ve ever read…along with “Ghost Story” by Peter Straub. The characters…his writing makes it easy to visualize the story. Truly a masterpiece. This is certainly King’s masterpiece. Quite possibly the best book I’ve ever read (along with another Stephen King epic, “11.22.63”). The characters are all brilliantly well-drawn and believable, some are even likable. I’ve read it 7 times since it was first published and fully intend to do so again. I have heard Stephen King say it’s disheartening to hear that people’s favorite book of his was written 30 years ago… But I would say, “We didn’t say it’s your “BEST”, we say it’s our favorite! Although for me, “The Green Mile” runs a close second. First time ever that I was upset about having to go to sleep! Got up in the early morning hours because I just HAD to get to the end of that book! One of my absolute favorites. As much as I loved the Lord of the Rings books – no book ever since has had that effect on me. Always loved Steven Kings books of which I have numerous hard back copies. 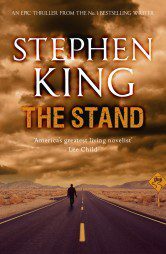 The Stand has been one of my favorites for many years and has been re read by me on many occasions and very well enjoyed each time. Great writer. Recently bought my third copy of this book because the first 2 just were falling apart…. Best written book ever! I just finished re-reading this for the, I believe, 5th time. I fell in love with it when I first read it as a teenager. I love Stephen King’s books, but this is by far my favorite. my book to is worn from years of reading it. I loved the movie too ……..I will never understand how in the world Rob Lowe did’t get an emmy for his portrayel of Nick. Everytime its on TV, I sit down and watch it. And the intro of Don’t Fear the Reaper – PERFECT ! One of the best ever………I know it would be hard but I wish they could make a full length movie out it……..the mini series is becoming a little dated……but I’m afraid they would cut it to pieces…….